Looking for solar panels for home? We install Solar Panels Across The UK. Huge Savings. Great Service. Reduce bills. Get Paid to Generate Electricity. With a Forever Green Solar panel installation. Forever Green Energy fitted my solar panels to an excellent standard and the panels have paid a return exactly as forecast. In fact they are slightly in excess of the forecast and my electricity bill has fallen significantly. The salesman explained everything clearly. The quote was competitive. The solar panels have produced slightly more electricity than promised, despite a very cloudy summer. The meter is tucked away neatly in a corner next to a bookcase. SunPower’s high-efficiency panels produce more energy than conventional panels which means you need fewer panels to generate the same amount of energy. If you’re looking for an effective way to reduce your utility bills by generating renewable, sustainable energy, then solar panels are the perfect green energy solution. After the initial installation costs, the energy you generate will run your household appliances and lighting and therefore reduce your utility bills. Benefit from a range of incentives such as grid trading, time of use charge, and frequency response. First and foremost, at Forever Green we are electricians, plumbers and builders. That’s our core trade. So you can feel safe in the knowledge that we are experts in our craft when it comes to installing solar panels. Our One Day Installation is the best way to get solar panels installed on your home. Discover the process from start to finish, where do we start, what happens before your installation date, and what happens on the day. The solar panel is the ultimate clean, renewable energy source for your home. Find out how everything works, how the panels generate electricity for you and how they are connected to your home. Use the form below to get in touch and find out how solar panels can save and earn you money. 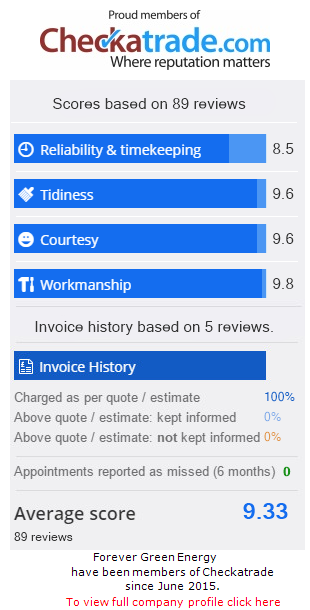 Once you request a free quote, our team will be in contact within 24 hours (usually sooner).